The largest and most cosmopolitan of the three Cayman Islands is Grand Cayman. It is the most visited and is characterized by its blend of both Caribbean style as well as being the financial center of the region. The famous Seven Mile Beach, which is often rated as one of the most beautiful beaches in the Caribbean, can be found here as well of an abundance of facilities and entertainment options. There are over 150 divespots for all levels, both boat and shore dives. Whether you are looking for complete relaxation, exquisite dining, or nightlife, colorful Georgetown can offer it. With numerous cruise ships come and go, (duty-free) shopping has been made into an art and signature brands are sold everywhere. Several events, such as Pirates Week and Batabano (carnival), are also held here. 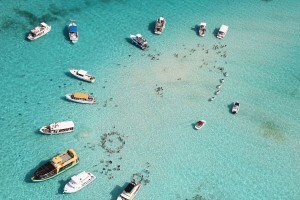 Out of the three islands, Grand Cayman is the most visited one by scuba divers and it gets most of the publicity. There are well over 150 divespots so never a dull moment. There are a myriad of divespots for all levels, both boat and shore dives. West Bay and the reefs along the mouth of the North Sound offer the most sites. The most popular ‘divespot’ is Sting Ray City where you can literally hug the Stingrays. This is on a sandbar at the Sound. Victoria House Reef is a nice reef, covered in orange tube sponges, sea fans and Caribbean Marine Life.